Pineal Research - "Vibrational Cleaning"
- that the key to the universe may be located at the very center of your brain - home to a pea-sized gland that lies deep within the human brain? Called Your Pineal Gland? Many People don't know how important this gland is! The time is NOW to develop your intuitive & psychic abilities ........ It's the "awakening" - that is so needed by many. This book will assist you to understand the amount of toxic exposures we all are bombarded with and how to 'green' your home, wisely. Since the pineal affects every system in your body physically, it has the potential to determine the expansion or contraction of your psychic awareness, consciousness, your intuition, your memory and experience with the Divine. Is it The Seat of your Soul? Is it your 'mind's' eye? The pineal gland has long been known as the master gland and as the centre of psychic awareness in the human mind. The ground-breaking work of Dr. Rick Strassman introduced to the world the role of meditation and more about the role of the pineal gland. 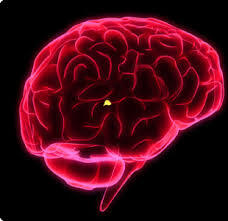 It is quite small and is located inside a 'cave' behind the pituitary gland. This amazing gland produces a hormone you may have heard about, called melatonin which regulates human daily body rhythms that deal directly with the day and night cycles. René Descartes (1596-1650) was one of the early philosophers who attached great significance to the pineal gland. He was experienced in vivisection and anatomy and he regarded the pineal as the 'principal seat of the soul'- the meeting place of the physical and the spiritual. He rightly pointed out the unique nature of the pineal gland's location in the brain being located near the center of the brain, between the two hemispheres but outside the protection of the blood-brain barrier. Exposed to a high volume of blood flow, the pineal gland is quite vulnerable to chemical toxins. In the ancient Vedic energy system of the chakras, the pineal gland is referred to as 'Ajna' or '3rd Eye' chakra. It is a well known symbol in Eastern literature. The ancients considered the pineal as a very important organ and knew that, in fact, the pineal gland functions very much like an eye, an inner eye- the 'third eye'. eye be single, thy whole body shall be full of light." Modern studies reveal that the gland's watery interior contains rods and cones-just like those found in the retina of your eyes! That means that your '3rd eye' has a structure remarkably similar to your two physical eyes. This is why when you visualize something strongly enough, you can literally see it "in your mind's eye" . The Pineal Gland's objective is to be the interface between the higher dimensions and the physical realm -like Descartes had mapped out earlier. Psychics consider it to be the link for inter dimensional experiences and on opening the Portal to the Divine so that the higher light and unconditional love can enter into your physical form. The pineal is a doorway to higher consciousness and bliss and facilitates multidimensional thinking, mastery of energy and manifestation via thought waves amongst many other functions. Are you blocking your Higher dimensional Gateway? The Pineal obviously plays an important role in your overall well-being: it has the highest blood flow second to the kidneys, has a connection to your sleep cycles and retinal-like rods and cones. Unfortunately for most of us, this gland is atrophied, dormant and calcified to the point of being useless. Neuro-toxic chemicals poison your pineal and the most common ones are found in your own homes as household and personal care products. A number of these are outlined in detail in my "Vibrational Cleaning" book along with one of the most toxic to the pineal - FLUORIDE! During the late 1990's in England, a scientist by the name of Jennifer Luke determined that the pineal gland, located in the middle of the brain, was a target for fluoride. She undertook the first study of the effects of sodium fluoride on the pineal gland. What she discovered was quite shocking: the pineal gland simply absorbed more fluoride than any other physical matter in the body, even bones.... fluoride accumulates to strikingly high levels in the pineal gland. She points out in another study: That after half a century of the prophylactic use of fluorides in dentistry, we now know that fluoride readily accumulates in the human pineal gland. In fact, the aged pineal contains more fluoride than any other normal soft tissue. "Fluoride is likely to cause decreased melatonin production and to have other effects on normal pineal function, which in turn could contribute to a variety of effects in humans." (National Research Council 2006). Luke's and other studies established that fluoride (F) exposure contributes to the calcification of the pineal gland. Upon dissection of a number of pineal glands, the calcification resembled gravel composed of calcite (calcium carbonate) and/or calcium hydroxylapatite. Pineal calcification has been linked with stroke incidents, schizophrenia, may contribute to melatonin deficiency and circadian timing irregularities, may be linked to the pathophysiology of tardive dyskinesia and Tourette's syndrome and many other disorders. Listen to Talk Show, You Awakening"
"This call is filled with empowering information about how you can make simple changes in your everyday life to increase intuition, improve memory and brain function, and even general health and peace of mind. She makes links between environmental causes and biological results that you won't easily find elsewhere, information that can make a big difference for you and your loved ones.